Hi guys! 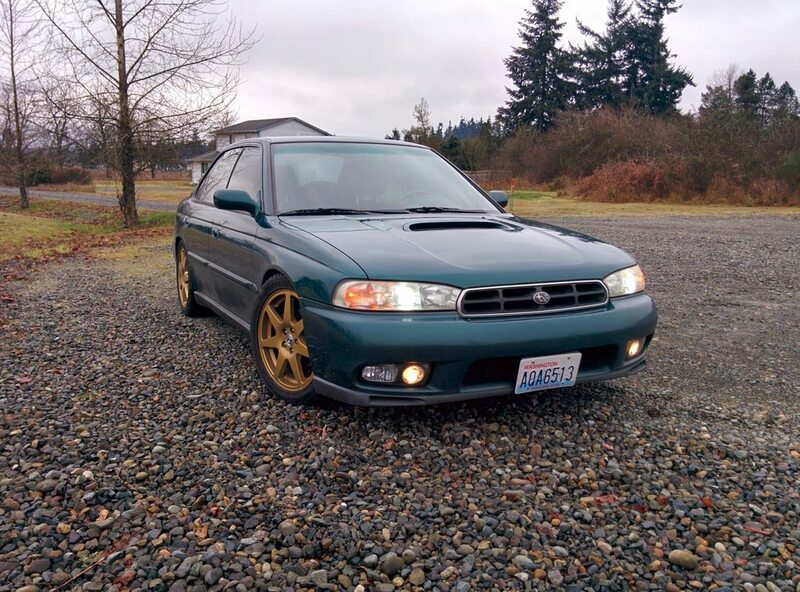 I have owned a few first gen turbo Legacy sedans and wagons but I've been without turbo power for a while now. 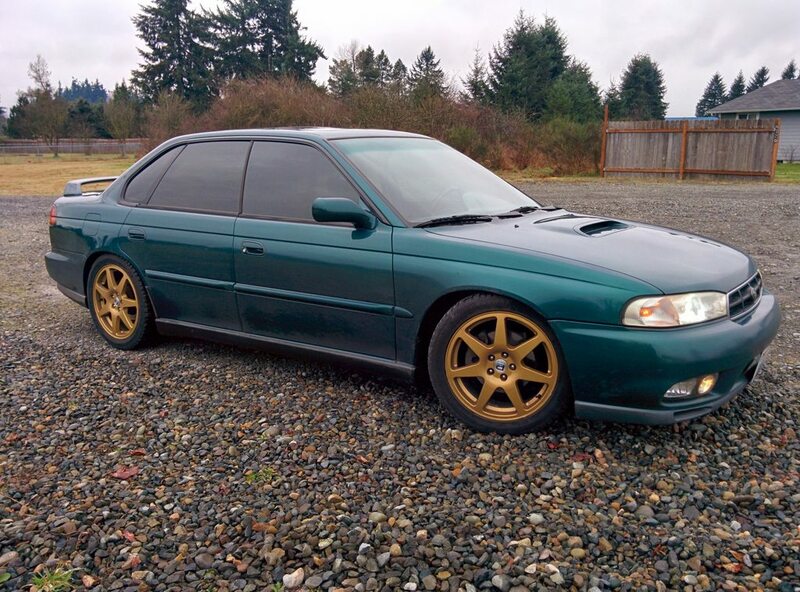 That all changed last weekend; I finished my WRX swap in my '99 Legacy. I figured I'd pop back in here and show you guys since I now have the "SS" that Subaru never gave us in the second generation. Bought it at 214k miles and put in the third set of headgaskets for the original EJ25D. 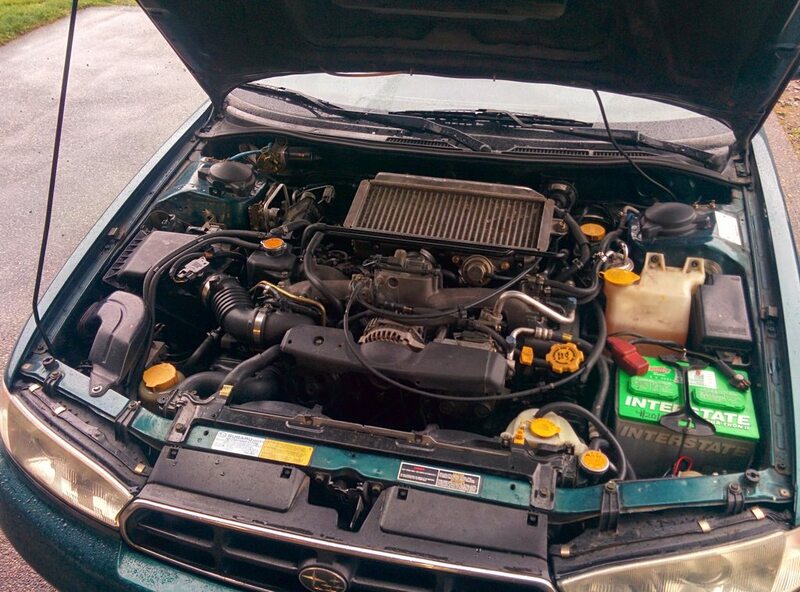 The engine eventually gave up the ghost at around 225k miles so I built an EJ22e/EJ205 hybrid to swap in. I merged the harness and did all the work myself and will be tuning it with Romraider over the next few weeks as I wrap up the loose ends from my swap. Road tuned with Romraider by me! Looking good man. I like that color on the gt's, my friend has a 97 in the same color. One thing I'd suggest is getting an intercooler splitter for the hood so you can direct the air from the scoop directly onto the intercooler. I got the one I have installed from a gentleman named Ben Thurgar on facebook after speaking with a few other importers and them either not knowing what I was talking about despite sending many pictures or they just didn't care enough to source one for me. Ben either owns or works at a dismantling yard in NZ and had no trouble getting me what I was looking for, and quickly to boot. Thanks for the suggestion, I've been looking for a splitter and had just about settled on using/modifying the WRX one. Does the TT splitter actually fit the WRX intercooler in a Legacy engine bay? I have not been able to find any information about that setup aside from looking at pictures of ZeroSports splitters on eBay. The wrx intercooler is a little wider than the TT/ej20k intercooler but other than that they're fairly similar in shape and placement. I don't see any reason it wouldn't work for your swap. I also eydballed those zero sports splitters but I couldn't justify one at the prices they're listed at. I got mine for less than half the price, and it came with the rubber duct so it will significantly less air loss around the ends. That thing is pretty sweet alphius. I'm jealous. An outback bumper would look cool. Are you using the wrx turbo then? What kind of compression ratio? what pistons? Also, I sent you a pm last night. I'm not a fan of the Outback bumper swap. I like the way mine looks with the stock bumper and JDM projector foglights. I am using a TD04 for quick spool. The engine is a completely stock 1991 N/A EJ22 block with stock pistons and all. It's about 8.8:1 CR. It has so much more low end torque than a stock EJ205. I'd say it is comparable or better torque off boost than the EJ25D that came out a couple weeks ago. I'm not shooting for tons of power since this car is my DD; I want a nice torque band and great daily driving characteristics. I don't have any plans to upgrade the engine aside from the tuning I need to do so I don't blow it up. This build is interesting because from what I can tell the N/A EJ22 is equally as strong or stronger than a stock EJ205. The cylinder walls are the same thickness, the crank and rods are very similar and the pistons are potentially even stronger than EJ205 pistons. This only applies to the early 90-96 EJ22. I found a few people running EJ22 bottom ends in WRXs; one running a 20G at around 320whp for over 3 years with no failures and another who made 365whp on pump gas with a stock EJ22 bottom end. The key is to tune it properly for the increased compression. I've wanted to do the same thing with my 20g/k heads for a long time. maybe if I get the Esl board agai. I'll give it a shot. Just hard to find a low miles ej22e. My setup has got some undesirable lag compared to when I had the forester higher comp block. I think with a 2.2 or 2.5 it would rock. Now I just need to get mine done. For sure dude! Get it done! Haha. It looked to me like your swap was way more pieced together than mine, I stuck with factory stuff and had an entire parts car to pull parts from so I didn't have to spend a lot of time finding little things here and there. I'm sure yours will be tons of fun and faster than mine when it is done. The 92 does look pretty sweet with the 02 dash installed tho. Just curious, did those power steering lines just bolt up at the cross member or did you need to find an adapter? They bolted right up. No issues. Its a full WRX power steering system and the factory 99 rack. You know if the fittings are the same size as the fittings on my 92 rack? They should be Chris, the SS rack is considered to be a bolt in mild upgrade to the second gen rack. Looking good, for sure a sleeper. Think those are more of a sleeper than maybe the first gens? Super sleeper! 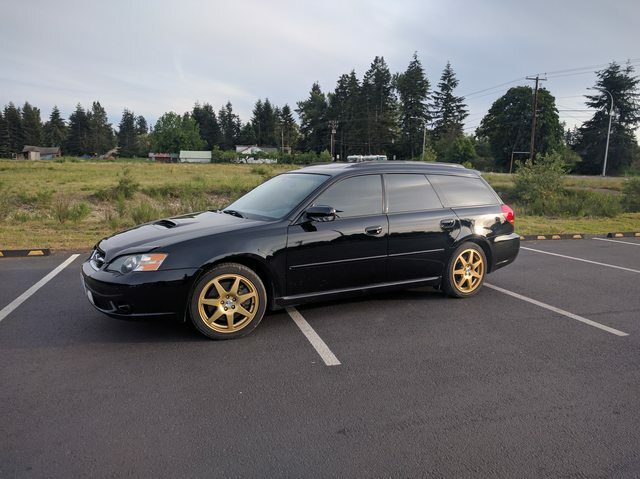 Do you think the gold wheels hurt the sleeper image? I've still got a soft spot for the 2nd gen Legacies. They are still one of the better looking legacy generation. Engine bay cosmetics are done, my final to-do list is taken care of. Last item on the list was to install a GrimmSpeed BCS to fix my factory BCS's inability to make over 14psi. The GrimmSpeed is in and I'm now making a peak of 20psi in the midrange tapering down to 13 by redline. This... this is fun. Damn lucky! Do this in my car. For some reason my car surges when I'm at freeway speeds and get on it. Don't know if it'fuel cut or knock. Did you tune this yet? You even got to keep the ac. That's nice. You are running the ej22e S/B with the ej205 everything else? How does the combustion chamber volume of the ej22e heads compare to the ej205 (49cc) heads. Where does that put your static CR? Just curious. ej22e heads are 40-41cc depending on who did the measuring. Static C/R on my engine is around 8.9:1. 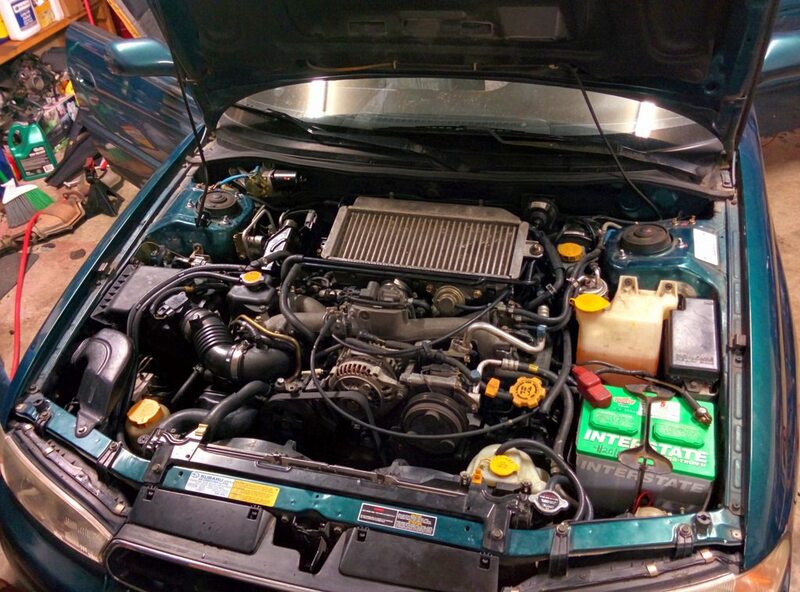 Yes, its a 1991 EJ22E shortblock with the complete 2005 WRX heads and intake manifold.